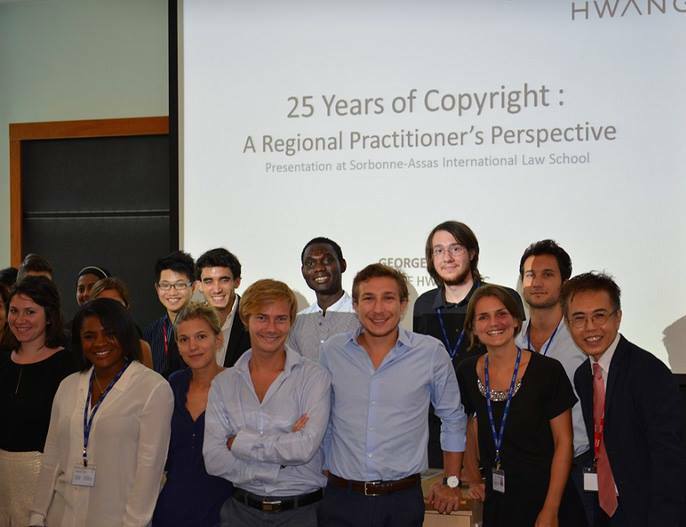 14 March 2014 – George Hwang, delivered a talk at the Sorbonne-Assas International Law School. Drawing on his vast regional experience as a Commercial Intellectual Property Lawyer, George gave a sweeping view of the inter-relationship between international copyright treaties and their ramifications on regional transactions, as well as trends in copyright laws. He reminded the audience that the ultimate aim of IP law is to ensure that inventions and creations can be shared for the good of mankind in a fair manner. The talk was attended by approximately 30 foreign lawyers including IP specialists and a lecturer from SMU. Dividing his talk between practice and policy related issues, George observed the IP trends between pre-TRIPS and post-TRIPS. For practice issues, he gave concrete examples of the advantages of TRIPS in copyright management. On the policy level, the trend has moved from one purely on the side of IP owners to balancing them with the rights of users. The right to health has been an issue in patent law since the Doha Declaration of WTO. We are seeing more and more of Freedom of Expression in copyright now. Europe’s robust resistance to the Anti-Counterfeiting Trade Agreement (“ACTA”) and the recent Marrakesh Treaty for the visually disabled are good examples. Before bringing the session to a close, George touched on the role of lawyers in effecting change. This can be done through litigation, lobbying and scholarly writings. To illustrate this, George talked about his work with the Law Society’s IP Committee and the recent landmark case of James Michael Dorsey v World Sports Group at the Court of Appeal where he was co-counsel.